Beat Cop: Will You Want To Beat This Game? 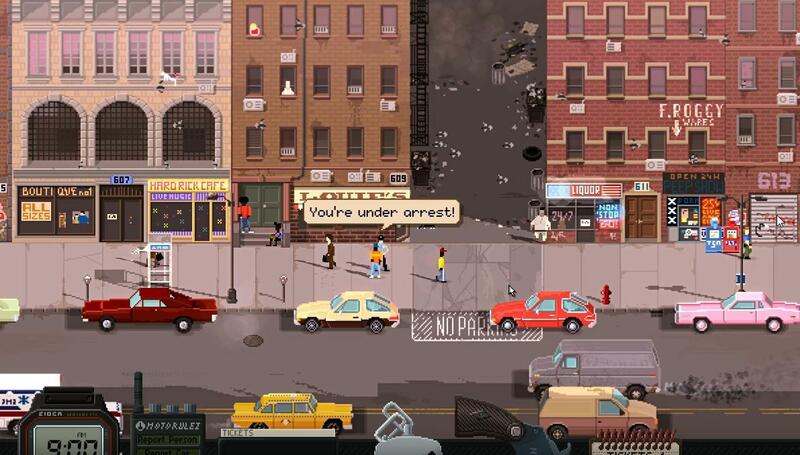 Beat Cop by Pixel Crow and publisher 11 Bit Studios is another great indie title from a small Polish studio. 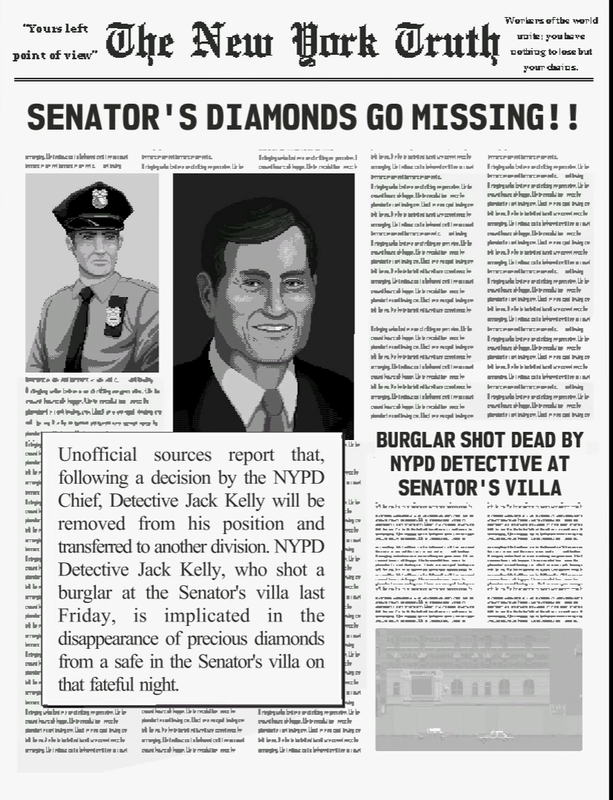 In the game, you play as Jack Kelly, former detective turned Beat Cop due to being framed for robbery of a Senator after stopping a burglar at the Senator’s villa. You’ll now be spending the next 21 days clearing his name before it’s too late. Jack is demoted to a parking enforcement officer for a street in Brooklyn, not very glamorous for a former hotshot detective. 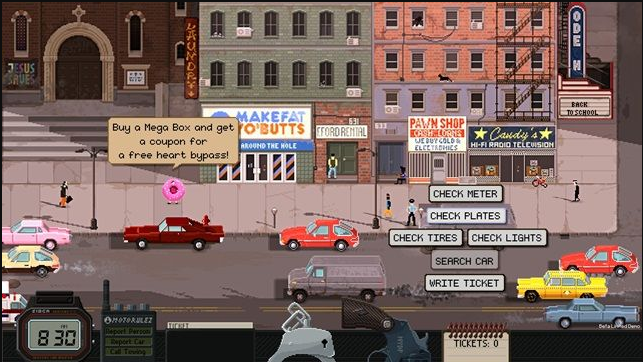 You may feel that writing tickets is a little too mundane for your tastes, but the interactions, funny dialogue, and even being a meter maid, can be quite enjoyable and satisfying. This game is dredged with influences from movies like Lethal Weapon, Dirty Harry, and Miami Vice. The best comparison to be made is to Paper’s Please, in both games you’re a civil servant with a menial task to do, but from that you have an addicting game play mechanic wrapped in a life or death balancing act that moves forward with an intriguing plot. Back at the station you’re treated to plenty humorous banter between you and your brothers in blue. This is where the game lays out your days objectives. You’ll be writing x amount of tickets for parking violations, poor tire conditions, broken lights or catching thieves shoplifting from the shopkeepers you visit daily on patrol. You’ll have to fill out your quota for the day while dealing with the citizens of Brooklyn and build a relationship with your community to pick up clues on who framed you. In the game you’re asked to start paying alimony checks to your ex wife, sadly a cop’s salary might just not be enough to cut it without doing a little moonlighting on the side. This is when you can choose to help the shopkeepers with various assignments, most of them involve you taking an object from point a to point b. 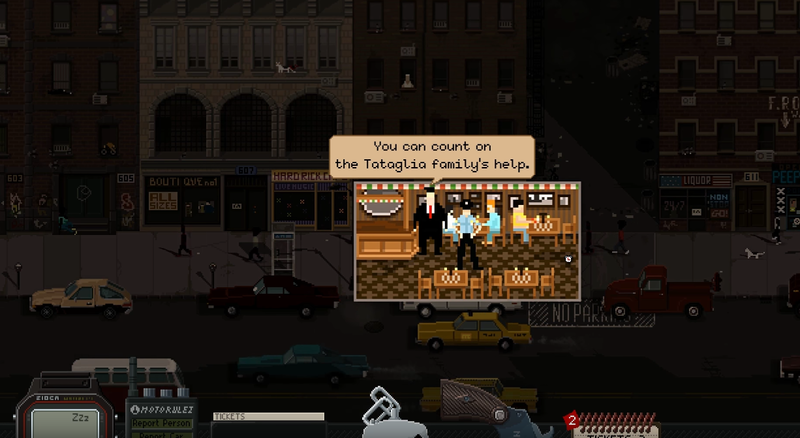 Aside from the shopkeepers, you’ll be dealing with two factions of criminal scum, the Italians, and the Crew. These two give you missions daily which will strengthen your relationship between one of the factions. If you do enough missions for a particular faction you can accrue enough money to complete the game before the 21 days are up without learning who framed you. But if you become too friendly with one faction then it’s game over, and your poor ex-wife won’t be collecting that sweet alimony check. Do you take a bribe from someone who doesn’t want a ticket, or skip your shoplifting watch and help a little girl who lost a cat. If you skip the ticket then you may not fulfill your quota for your jerk of a captain. Depending on the choices you make this will influence your standing in the various different subsets of the community. Keeping in mind that this game has multiple endings that are affected by the way you interact with the people around you. The guys at Pixel Crow did a with the game’s art style. 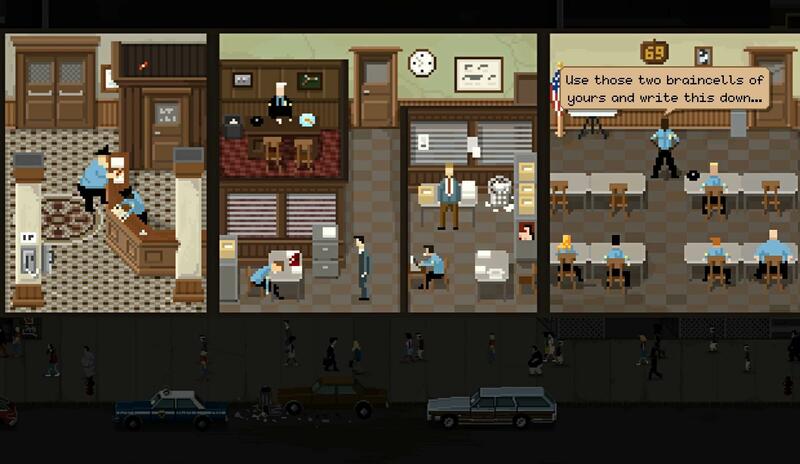 The pixel art is highly detailed and this game relies on the 80’s cop show feel. Although, you’ll be looking at the same street over and over again for the next three weeks. But the pixel art is a treat to look at. There isn’t any voice acting, this is a text based adventure, but the dialogue is mostly funny at times; you may here a few off color terms thrown out here and there, but the guys at Pixel Crow were trying to keep with the time this game is set in. Some lines of dialogue are repeated throughout the game, for example, when visiting the shop keeper’s they’ll repeat “Is that a gun, or are you just happy to see me?” Little bit tiresome to hear for the hundredth time. I like the game, there is a lot of pressure to get through the day’s work before the clock hits 6 PM when it’s quitting time. The 80’s cop show/movie references and humor are definitely something that die hard fans of the genre will enjoy. 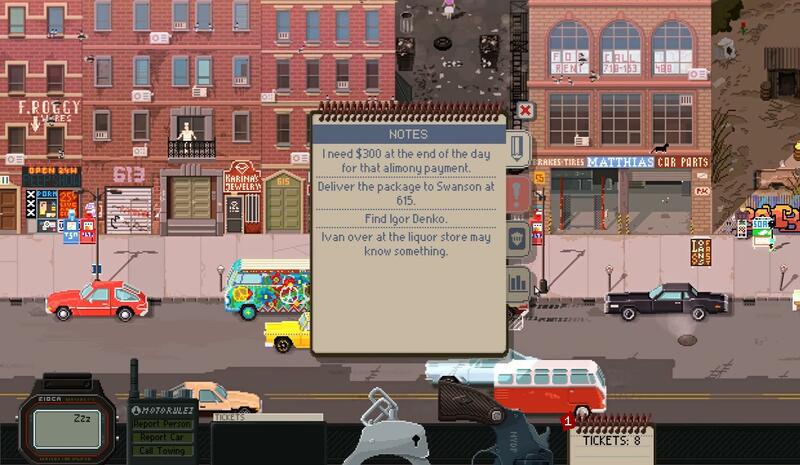 The tense money, time, and relationship management all the while trying to uncover a detective mystery is worthwhile enough to recommend a play through on more than one occasion due to the multiple endings and challenging game play mechanics. I believe that Pixel Crow can even take this game to iOS and Android in the future since the point and click controls would transfer seamlessly. 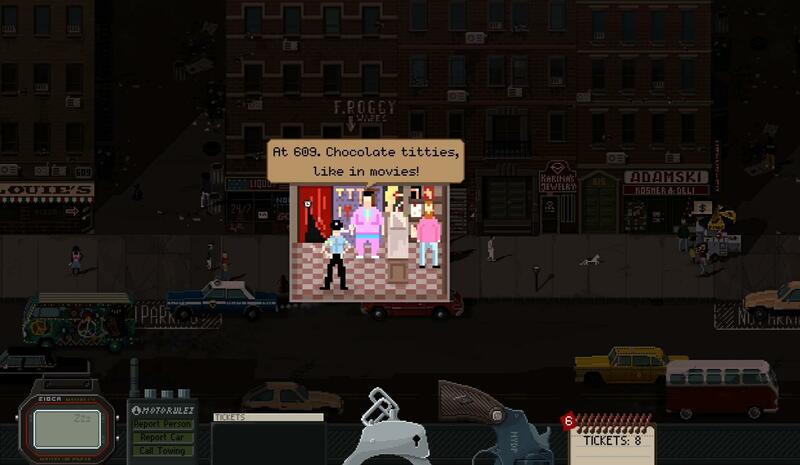 Beat Cop is available on Steam, Humble Store, and GOG. For additional information about the game check out Pixel Crow along with any other games they may have coming down the pipeline. In the meantime follow them on Twitter. Lemon Demon, or Neil Cicierega is a name you might be familiar with. Known best for internet musical confections such as Brody Quest, and perhaps more so for Potter Puppet Pals also sets out to nail down his own weird corner of the glittery strange subsection of nerdy electro-pop rock. His latest album, Spirit Phone, taps into the nerd territory of catchy-hooks and deranged subject matter ala They Might Be Giants with the slick, glassy production and synth driven melodies of Joe Jackson. The subject matter is perfectly delicious for any aficionado of the stranger side of life, ghosts, aliens, general uneasiness, even protecting your grandfather from the woes of modern technology. Over the span of this album we are privy to a wide swath of weirdos and oddities. Cabinet Man gives us a glimpse into the tragedy of a man between two worlds, life as video game and the eventual dissolution of the Arcade era. Sweet Bod unfurls a twisted view from a well intended party bent on a rather unorthodox fetishization of a dead body, reassuring us ‘it’s not sexual, it’s confectional…’ Spiral of Ants paints a beautifully eerie meditation on ant death circles and in doing so also provides a meta-meditation on what it means to be alive, if anything at all. I could go on and on about the merits of this project and delve into the deeper and not so deep implications found on Spirit Phone, but it’s probably just better if you pick it up and listen. Nerd Hall is still alive and kicking, hit us back for more reviews, news and maybe even some clues. We’ve got it on lock. Love you all (but not like that).